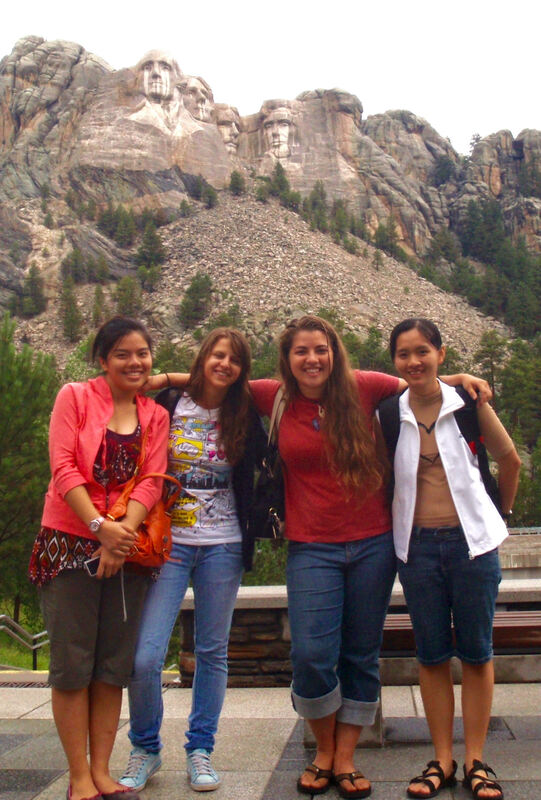 I visited Mount Rushmore National Monument on a 2009 road trip across the country, where I met up with two friends from Vietnam and one from Lithuania who had come to the U.S. for the summer. Our decisions as American voters have impacts on the rest of the world, and I hope we make choices that benefit those within our borders as well as on foreign shores. Over the past year, I’ve journeyed back and forth across the U.S., exploring big cities, small towns and some really obscure destinations, but primarily using America’s national parks as the anchor points for my travels. As this year’s election has approached, it’s become more and more apparent to me how relevant our parks are to many of the issues currently at stake, and after absorbing several dozens of parks’ worth of information on our country’s people and history, I felt much more equipped to vote with confidence and conviction today. America’s national parks don’t just provide brilliant backdrops for our vacation photos; they tell the story of our nation and its place in the world, and they provide insight on how we became the country we are now. I’m not just talking about the big parks like Yellowstone and the Grand Canyon, although those do have a lot to teach us. I’m talking about lesser-known but still monumentally significant parks like Little Rock Central High School National Historic Site in Arkansas, which reveals personal stories of the fight for integrated schools, and Manhattan Project National Historical Park in Tennessee, New Mexico and Washington, which dives into the difficult decisions and actions behind the development of the nuclear weapons that ended World War II, and Boston National Historical Park in Massachusetts, which gives insight on the reasons why America decided to separate from Britain and how much they were willing to sacrifice for freedom. How’s this for a mood lifter?!? Flightbucks posted this graphic to its Facebook page to announce the winner of its “worst travel delay” contest. Recently, I’ve been in a bit of a writing rut, and it’s been eating away at my professional confidence. Every time I’ve sat down to write in the past couple of months, I’ve second-guessed myself with every sentence, and awkward uncertainty and self-doubt have hung over my keyboard each time I’ve sent off another article to one of my editors. They’ve had nothing but positive feedback for the content I’ve turned in, but still I’ve been plagued with frustration and anxiety at the abilities that I see, in many ways, as core to my identity. For awhile now, I’ve needed something to pull me out of this funk, give me a kick in the pants and get me back on track. Not gonna lie, I found it pretty weird to be on the subject side of an interview! Many thanks to Taylor Wyllie for her kind words in this profile :). One year ago this week, I stood on the porch of my beloved old farmhouse in Leesburg, Virginia, sweeping off the steps in the sunshine, when a moving truck pulled up and a guy stepped out. His U-Haul at the bottom of the steps matched mine in the field, as he was the new tenant moving in that day and I was moving out. We chatted for a few minutes, and since I was there, he asked if I could show him any quirks with the house that he might need to know. I agreed, and we spent a few minutes walking around and talking about how to keep the pipes from freezing, where he could find the breaker box and water shut-off valve, the cheapest place I’d found to buy firewood for the two wood-burning stoves and a few tricks I’d learned to help coax the stubborn old lawnmower into submission. He thanked me and began carrying in boxes while I swept off the last few steps, then I hit the road. When my editor at Blue Ridge Outdoors magazine heard I was going on a national parks road trip, he suggested that I write a blog series for www.blueridgeoutdoors.com based on this journey. I wrote the following post as the initial entry for that series, and I wanted it to introduce readers to the idea behind this trip that they might read about through the year. I also wanted to convey this experience in a way that they could connect to, so I hope this accomplishes that. Stay tuned for updates on the series! This first post is a little weird, but I hope you like it :). Trailhead sign just off US-322 south of Clarion, Pennsylvania. It only took half an hour to drive from my home to the trailhead, but it felt like a lot longer. My short hike on the North Country National Scenic Trail today will be the start of several goals for this year, and it’s been a rough road so far just to get here. And I haven’t even gotten out of the car. It’s January 11, a little less than two weeks into the new year. I set a resolution to hike at least 100 miles on this trail this year, and I’m pretty sure I can do it if I can work out the logistics in my ever-shifting schedule. 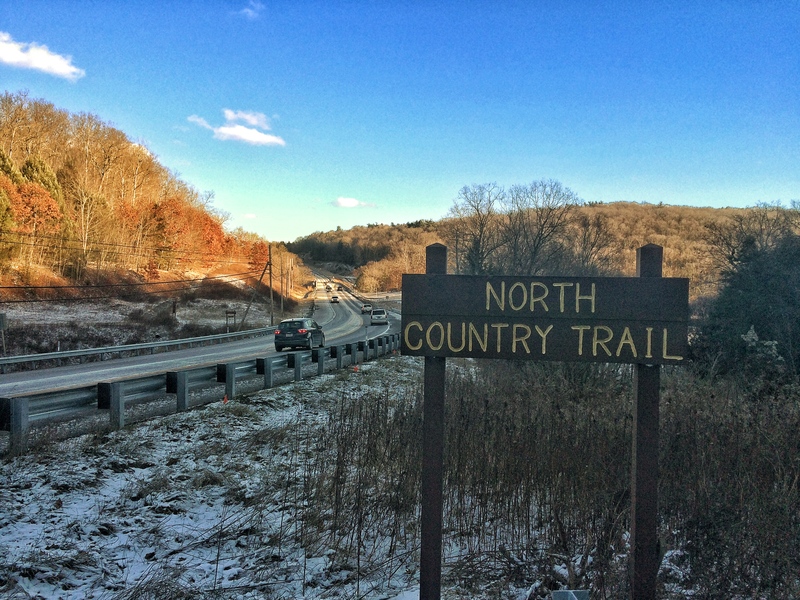 The trail stretches across the “red plaid nation,” as the website called it, from New York to North Dakota, and it runs right through the county next to mine here in rural western Pennsylvania. Plus, I should be visiting some other areas of the country where the trail runs this year, so I hope I’ll get to see a few different sections, at least. Not a mountain, but I’m not complaining. Somehow, it’s been nearly two weeks since I got sick with this lingering bug, which has morphed from the flu to a sinus/upper respiratory thing to laryngitis, so this big national parks road trip I had planned to kick off over New Year’s is temporarily on hold until I’m back to 100 percent. I was really looking forward to my planned New Year’s Day hike in Acadia National Park and witnessing the country’s first glimpse of the sunrise in 2016 from the summit of Cadillac Mountain, but maybe I can do that next year. Still, definitely a drag. On the positive side, the quarantine has given me some good time with my folks and my dog that I would have otherwise missed out on, and I’ve been able to work on a few assignments from the comfort of a recliner versus the back of a station wagon or a crowded coffee shop filled with distractions, so that’s been helpful!